Another interesting day yesterday for silver traders, as once again we saw silver prices edging higher in the silver trading session, with the prices of silver and the gold market apparently moving in marginally different directions once again. 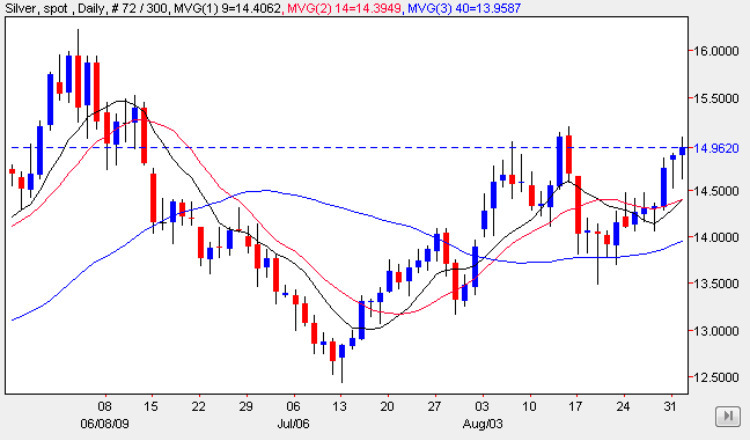 Whilst gold remains waterlogged in a tight trading range and consolidating daily into an ever more defined pennant formation, silver on the other hand continues to edge higher as it continues to creep towards the psychological $15 per ounce price handle once again, with yesterday’s candle ending the silver trading session with a deep lower shadow, reinforcing the bullish sentiment that prevails at present. With the 9 day moving average now crossing the 14 day average, again this technical cross adds more weight to this view, and the key for the longer term will be whether we see a break and hold above the minor resistance level at 15.35. If so then we should see a retest of the $16 per ounce price point in due course, and from the last two days where we have seen strong moving average support, combined with deep lower shadows, I would expect to see silver prices trading higher today once again.